A great expanse of countless wonders, the Mauricie region invites you to come enjoy an unforgettable stay. The 40,000 square kilometres (24,855 mi) of the Mauricie region has something for everyone; let yourself be caught up in a whirlwind of incredible discoveries. 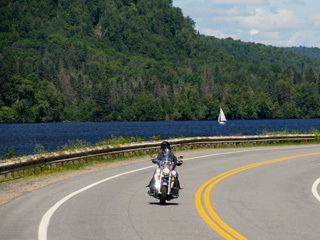 History, culture, nature and adventure await in the Mauricie: the true nature of Quebec! The Mauricie region is a destination where urban centres, forests, lakes and rivers create a harmonious diversity that is filled with activities for the whole family. Whether you love the outdoors or history, you’ll have a lot of fun in the Mauricie. In summer and winter, enjoy an adventure in the woods or on the water. Parks, reserves, controlled zones (Z.E.C.’s) and outfitters are some of the places you can commune with nature. Go back in time to relive a historical or cultural adventure while visiting a heritage house on the Chemin du Roy (King's Highway) or discover the age of industrialization and hydroelectricity.